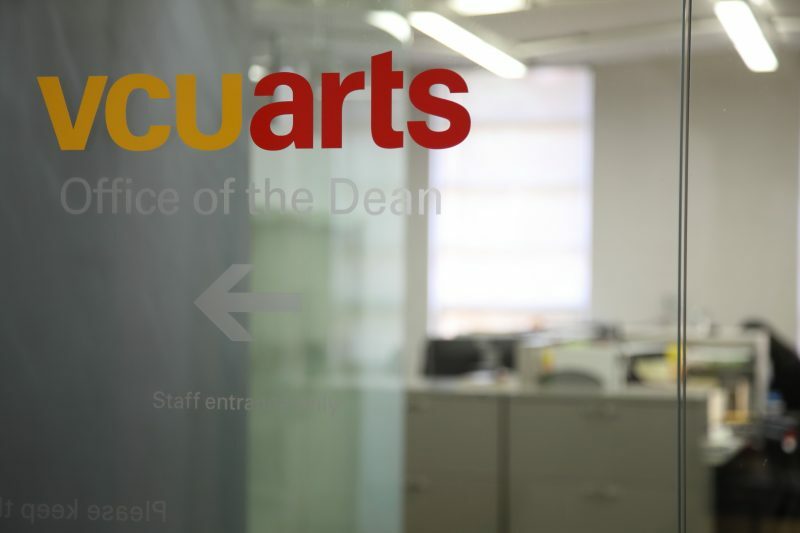 A VCUarts professor who called security on a black colleague in October is suing university officials, including President Michael Rao, claiming they have silenced him despite having been cleared of wrongdoing by an internal investigation. Painting and printmaking professor Javier Tapia was placed on administrative leave less than a month after he called security on Caitlin Cherry, who teaches in the same department. Since then, he has not not been allowed any contact with university employees or students, according to a federal complaint filed in December. 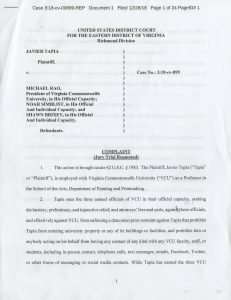 In addition to being prohibited from talking to students, the lawsuit says Tapia cannot post comments on social media about President Donald Trump, an exhibition at a Richmond museum, a statement by the Pope, South American politics or anything related to people affiliated with VCU. Tapia filed a lawsuit in federal court in the Eastern District of Virginia in December. “The order hangs like a sword of Damocles over Tapia’s First Amendment freedoms,” the lawsuit states. Cherry filed a racial discrimination complaint on the day of the incident. The lawsuit states investigators from Equity and Access Services interviewed witnesses, reviewed documents and visited the site of the incident from Oct. 29 to Nov. 14. While the university didn’t publicly share the findings of the investigation, the lawsuit says it did not find evidence Tapia had called security because of Cherry’s race. Tapia and Cherry were both told the findings of the investigation. On Nov. 19, the university put Tapia on administrative leave. It was during this time, the lawsuit states, he had the ban placed on him. Tapia was placed on administrative leave on Nov. 18. Two of Tapia’s classes are now displayed in VCU’s course selection system, indicating he may return to teaching in August. Several students in the art department have shared a social media graphic telling students to boycott the classes. 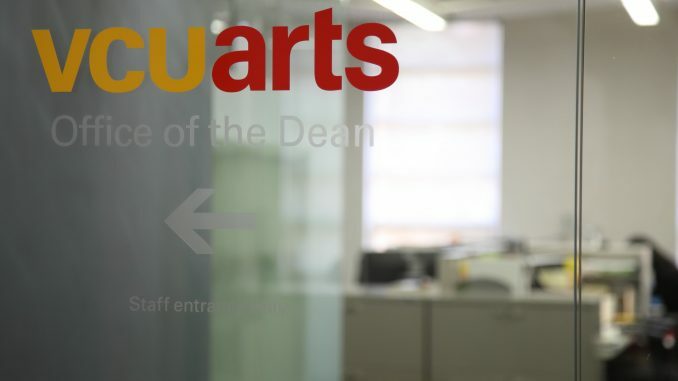 Shawn Brixey, the dean of the arts school, and Noah Simblist, chair of the painting and printmaking department, are named as defendants in the lawsuit. 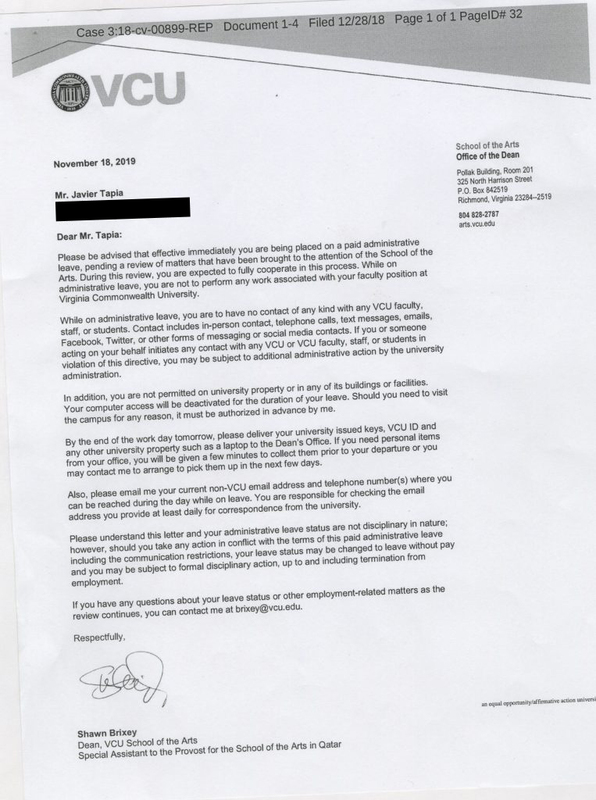 A VCUarts spokesperson confirmed Tapia is still employed by the university, but declined further comment. The fallout from the incident and ensuing lawsuit has shaken the painting and printmaking department, one of the most reputable at VCU. In November, nearly the entire painting and printmaking faculty signed a letter supporting Cherry and stating Tapia had acted in a prejudiced manner. Many of the department’s professors discussed the events in their classrooms and consoled students who felt Tapia’s presence produced a toxic environment. Now, students are bracing themselves for Tapia’s imminent return. Wansu Kang, a senior who has taken Tapia’s class, said she never saw signs that he was racist. Despite this, Kang said, he should not return. Some other students said Tapia has showed signs of micro-aggressive behavior in the past. The latest incident has compounded to what some students have described as the professor’s reputation of being insensitive and out of touch. 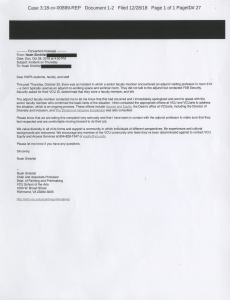 On October 28, Noah Simblist, chair of the Department of Painting and Printmaking, sent a letter to students and faculty notifying them of the incident between Tapia and Cherry. Tapia could not be reached for comment. Cherry, who is named “Professor X” in the lawsuit, was eating breakfast in a room reserved for faculty and graduate students on Oct. 25 when Tapia entered the room. While the lawsuit says the two greeted each other when Tapia entered, Cherry told The Commonwealth Times in November that Tapia did not respond to her greeting. Ten minutes later, a school security officer entered the room and asked Cherry to see her identification. Cherry said she believed Tapia had called security on her because she is black. The lawsuit says Tapia called security because he thought she was a student. The event prompted outrage among students and an apology from the arts department in an email to students. It came amid a string of instances of white people calling authorities on black people doing ordinary activities, like holding a barbecue in a public park. Many of the incidents have gone viral on social media.